Heinz Mack, born in 1931 in Lollar (Hesse, Germany), attended the Academy of Arts Düsseldorf during the 1950s. In 1956 he also earned a degree in philosophy at the University of Cologne. Together with Otto Piene he founded the group ZERO in 1957 in Düsseldorf. 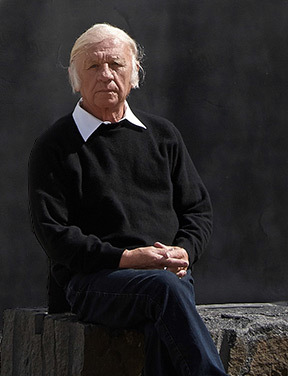 Besides his participation at Documenta II (1959) and Documenta III (1964), he also represented The Federal Republic of Germany at the XXXVth Venice Biennale in 1970. In the same year he was invited to Osaka (Japan) as a visiting professor. He also became a full member of the Berlin Academy of Arts, to which he belonged until 1992. Heinz Mack has been honored with major awards including the Art Prize of the City of Krefeld (1958), the Premio Marzotto (1963), the 1st Prix arts plastiques at the 4th Paris Biennale (1965), 1st prize in the international competition Licht 79 in the Netherlands (1979), the Große Kulturpreis des Rheinischen Sparkassen-Verbands (1992) and the Cultural Prize of the city of Dortmund’s arts council (2012). He also received the Grand Federal Cross of Merit with Star of the Federal Republic of Germany in 2011. 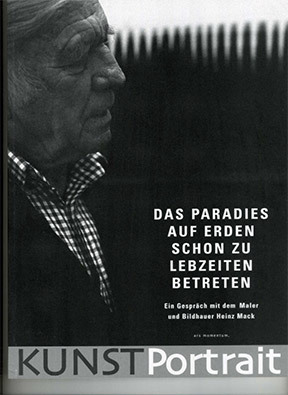 In 2015, Heinz Mack was unanimously voted an honorary member of the Kunstakademie Düsseldorf by the academy's senate. In 2016, the city of Düsseldorf bestowed the Jan-Wellem-Ring upon Heinz Mack. He received the Moses Mendelssohn Medal in 2017. His works have been shown in nearly 300 solo exhibitions and numerous other group exhibitions. They are also found in 136 public collections. Numerous books and two films document his work. Maler und Bildhauer Heinz Mack"